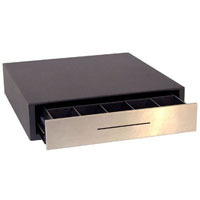 The APG Classic Cash Drawer has proven its superior durability, ruggedness and configurability in a wide range of the most demanding applications. In thousands of convenience stores, restaurants, service stations and similarly harsh POS environments around the world, the APG Classic continues to deliver millions of cycles of smooth, reliable operation . Steel ball-bearing slides, a sturdy latch mechanism, and a four function lock make the APG Classic the industry leader in performance and reliability.